Leopold's Crate: “Raisin” Awareness: A common food you might not have known is potentially toxic to your dog. “Raisin” Awareness: A common food you might not have known is potentially toxic to your dog. It seems a little random, I know, but did you know that grapes (and their dried counterpart, raisins) can be very harmful to dogs? I was surprised to find this out when I first got Leopold (and consequently delved into the world of dog knowledge!). Grapes contain a toxin that can cause the kidneys to fail in some dogs, which will lead to death if untreated. This does not happen in all dogs and I’ve heard many stories about people who feed their dogs grapes all the time without observable consequences. I imagine that, just like humans, tolerance to certain foods varies from dog to dog. Unfortunately, some dogs have dangerous reactions to consuming grapes and raisins, and this fruit has been known to cause the untimely death of many canines. The risk is high enough that the general advice is to just not give your dog grapes and raisins at all. 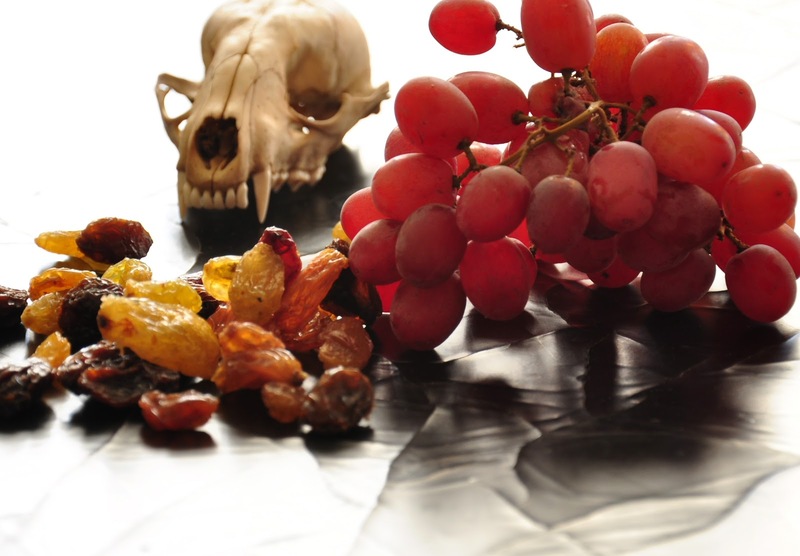 What can happen if a dog eats grapes or raisins? A dog might start to have some gastrointestinal upset including vomiting, diarrhea, and abdominal pain, and in some cases lethargy and depression. Following that, a dog’s kidneys can start to fail (acute renal failure). Renal failure is very serious and will lead to death if left untreated. As someone who is forever interested in the mechanistic components involved in everything, I’ve been looking into what exactly it is about grapes that are bad. Unfortunately, like many topics I research online, information varies. On the boards, I found some that say it’s only the seed (“My vet told me…blah blah blah”), some say it’s the skin. Many published resources say it is an “unknown” toxin. Basically, they just don’t know yet what about the grape causes the problem. What IS known is that sometimes grapes can cause a dog to go into renal failure and die. Personally, I’d rather not take the risk and I don’t ever give my dogs grapes or raisins. The way I see it, there are lots of other yummy treats available (blueberries, for example) that are known to be safe and even healthy. So why risk it? What should you do if your dog eats grapes or raisins? Take them to the vet! Right away! I’ve seen more than a few dogs come into the emergency clinic because they ingested raisins or grapes. When we have a dog come in that has eaten grapes or raisins, we generally try to induce vomiting if the grapes/raisins have been eaten within the past few hours. We once had a pair come in that had gotten into some holiday cinnamon-raisin bread (which was particularly disgusting because the cinnamon made the vomit smell delicious. Bleh!). We also sometimes feed the dog a substance that soaks up any toxins that might still be in the dog’s gut, and we monitor blood chemistry to help evaluate kidney function. Grapes may be a tasty treat for humans, but they’re best left out of your dog’s diet.